“God is love” is one of the most often-quoted sentiments from the Bible. But do we know what it means? Surprisingly, few do. Here’s what the Bible explains. 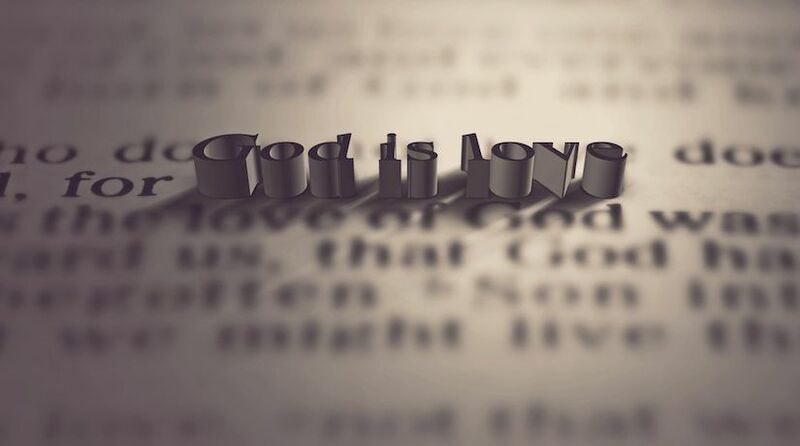 “God is love” is a direct quote from two different verses in the Bible—1 John 4:8 and 1 John 4:16. However, this truth, which is a description of the fundamental nature of God, is expressed many times in other scriptures. These verses are simply a sampling of the many times this truth is expressed in the Scriptures. God is love, and He expresses His love in many ways. However, none of the commentators explain the ultimate purpose of God—what God is doing because of His nature of love. The greatest expression of His love toward humanity is revealed in the purpose for our creation. One of the verses quoted above reveals the incredible truth of what God is doing because of His love. The apostle John wrote in 1 John 3:1, “Behold what manner of love the Father has bestowed on us, that we should be called children of God!” God’s purpose for creating humankind is that He wants a family—children. God wants a family of sons and daughters of His own kind. Please let the incredible reality of that statement register in your mind. God’s plan and purpose for human salvation is to offer all humanity the opportunity to become His own sons and daughters in His own family—on His level of life. God is love. Love is the fundamental essence of His nature and character—His very being. God is perfect in love. God’s love is manifested by His absolutely pure desire to care for, share and give. At present, the God family is composed of two members—God Most High (who is known to us now as God the Father) and the Word (the member of the God family who became the flesh-and-blood human being Jesus Christ—John 1:1-2, 14). These two members of the God family make up Elohim. Elohim is the first word translated “God” in the Bible (Genesis 1:1). Elohim is a plural word, the plural of Eloha. Elohim can be viewed as the family name of God. God’s purpose for creating humankind is to give all of us the opportunity to become heirs with Christ, a part of the ruling God family—to become the sons and daughters of God—brothers and sisters of Jesus Christ (Romans 8:14-17; Hebrews 2:9-11; Titus 3:7). John recorded further in 1 John 3:2, “Beloved, now we are children of God; and it has not yet been revealed what we shall be, but we know that when He [Jesus Christ] is revealed, we shall be like Him, for we shall see Him as He is.” Once we receive the Holy Spirit, God considers us His children; but we must complete a process of spiritual development before the fullness of the process of birth into God’s family can occur. Our destiny (if we submit to God and go through the process of conversion) is to become a member of the God family like God’s firstborn Son is now. If we inherit life in God’s family, we will become like God the Father and Jesus Christ. This is why God (Elohim) created us the way They did. With power and authority in the family of God also comes the requirement that all must be done in love, not in selfishness, pride, greed or arrogance. We must become like God in character and nature if we are to become like Him in being! “God is love” not only describes the nature of God the Father; “God is love” also describes the nature of God the Son (Jesus Christ). These two members of the God family deeply love each other. Love is their nature. The end result of the salvation process is to become the actual sons and daughters of God. In Their love, God Most High and the Word decided that they wanted to share Their way of life with others just like Themselves. They decided that They wanted to share all that They are and have with others. As a result, they ordained a plan and created human life with the purpose of giving human beings the incredible opportunity of becoming actual members of Their family. This plan for offering sonship to humankind is called salvation. To receive this incredible gift of eternal life in the family of God, all that God wants to see us do is to learn to grow toward loving Him as much as He loves us. The question that must be answered is, How does God want us to show love toward Him? God answers that question in His Word. John records, “For this is the love of God, that we keep His commandments. And His commandments are not burdensome” (1 John 5:3). “Now this is the commandment, and these are the statutes and judgments which the LORD your God has commanded to teach you, that you may observe them in the land which you are crossing over to possess. … You shall love the LORD your God with all your heart, with all your soul, and with all your might” (Deuteronomy 6:1, 5). “And now, Israel, what does the LORD your God require of you, but to fear the LORD your God, to walk in all His ways and to love Him, to serve the LORD your God with all your heart and with all your soul and to keep the commandments of the LORD and His statutes which I command you today for your good?” (Deuteronomy 10:12-13). “I call heaven and earth as witnesses today against you, that I have set before you life and death, blessing and cursing; therefore choose life, that both you and your descendants may live; that you may love the LORD your God, that you may obey His voice, and that you may cling to Him, for He is your life and the length of your days; and that you may dwell in the land which the LORD swore to your fathers, to Abraham, Isaac, and Jacob, to give them” (Deuteronomy 30:1, 6, 19-20). “And I prayed to the LORD my God, and made confession, and said, ‘O Lord, great and awesome God, who keeps His covenant and mercy with those who love Him, and with those who keep His commandments’” (Daniel 9:4). “‘Teacher, which is the great commandment in the law?’ Jesus said to him, ‘You shall love the LORD your God with all your heart, with all your soul, and with all your mind.’ This is the first and great commandment. And the second is like it: ‘You shall love your neighbor as yourself.’ On these two commandments hang all the Law and the Prophets’” (Matthew 22:36-40). “If you love Me, keep My commandments. … He who has My commandments and keeps them, it is he who loves Me. And he who loves Me will be loved by My Father, and I will love him and manifest Myself to him. … If anyone loves Me, he will keep My word; and My Father will love him, and We will come to him and make Our home with him” (John 14:15, 21, 23). These passages are just a sampling of the many scriptures that link these two truths. God is love. God in His love wants us to become His sons and daughters. All we have to do to become His children—to become at one with Him—is to learn to love Him, His family and His creation, as He loves. “And the glory which You gave Me I have given them, that they may be one just as We are one: I in them, and You in Me; that they may be made perfect in one, and that the world may know that You have sent Me, and have loved them as You have loved Me” (John 17:22-23).